On August 28, 1963, more than 200,000 Americans gathered for the ‘March on Washington,’ a political rally that was a key milestone in the civil rights movement. (Image courtesy Wikimedia Commons) The local chapter of the NAACP is commemorating the March on Washington with an event on Saturday, Aug. 24 at Growing Valley Baptist Church in Lancaster. LANCASTER – The local chapter of the NAACP is inviting all residents to a celebration Saturday to commemorate the 50th Anniversary of the March on Washington. Themed “Remembering Our Past – Embracing Our Future,” the event will be held from 4 to 6 p.m. Saturday at Growing Valley Baptist Church, located at 44818 20th Street West in Lancaster. “Stand your ground” laws and what must be done to keep the spirit of Trayvon Martin alive, and much more. “In the backdrop of the 50th Anniversary of the Civil Rights Movement, the AV-NAACP will lay out [the] next steps we must take in the Antelope Valley to fulfill the dream of Dr. King in bringing “Justice, Jobs, Freedom and Equality” in the heart of our community,” stated AV-NAACP President V. Jesse Smith. This event is free and open to the public. To R.S.V.P., call 661-222-8144 and leave your name and telephone number. View a flyer for this event here. 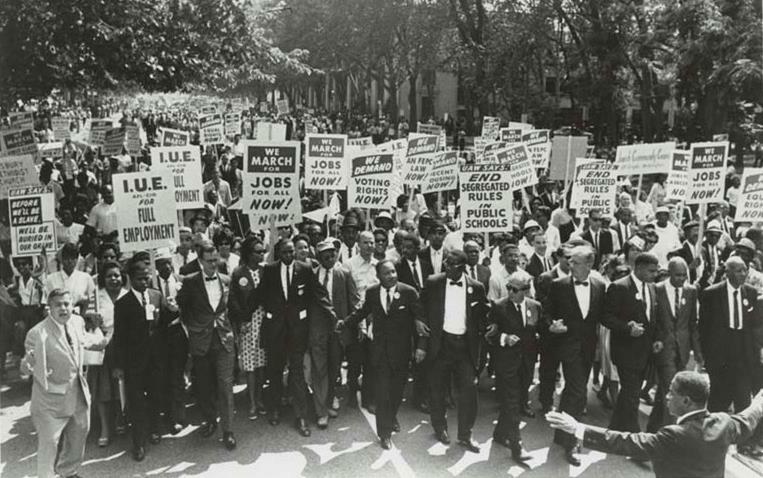 3 comments for "Local event today celebrates 50th anniversary of March on Washington"
To the Civil Right Activists capitalizing on this historic event: Please discuss the issues that are the most significant issues affecting our Black community. They are: #1: Black on Black crime and murders; #2: unwed mothers and fatherless households; #3: personal responsibility; #4: prioritizing and glorifying education, etc……. * The DOJ report is not addressing the real issues, only validating the “poor me” mentality that will always hold us back. * Law Enforcement interaction?? Only have to worry about that if you are out hanging out, smoking dope, drinking, and stealing. Those of us in the Black community who are working hard and doing right never seem to have negative interactions with the police. Amazing how that happens! * Section 8? Really? Please don’t discuss Section 8? This was not part of Dr. King’s Dream! * “Stand Your Ground” laws? Please…. Keep wasting our time with something that is not even the law in California. That includes Palmdale and Lancaster! The Trayvon Martin media hype has run it’s course. Now back to the reality of what is truly affecting our community. Black on Black crime. No more race baiting, its time to get SERIOUS and Keep it Real!